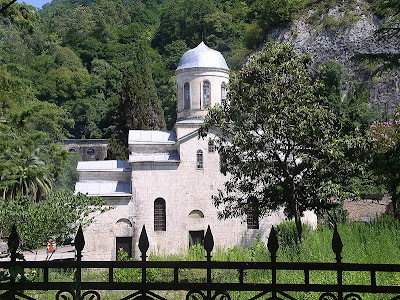 In 1874 Russian monks from the overcrowded Rossikon (Saint Panteleimon) Monastery on Mount Athos arrived to the Caucasus in order to find a place for possible resettlement. They feared that the Ottoman Empire would oust the Russians from Athos after the outbreak of the impending Russo-Turkish War. 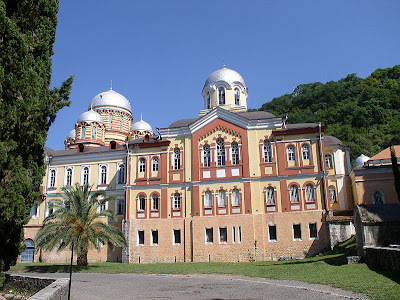 They selected Psyrtskha, and the Neo-Byzantine New Athos Monastery, dedicated to St. Simon the Canaanite, and was constructed there in the 1880's with funds provided by Tsar Alexander III of Russia. Eventually Russian monks were permitted to stay in the "old" Athos, and the New Athos monastery had much less occupancy than anticipated. In 1924, during the Soviet persecution of religion, the monastery was closed. It was later used as a storage facility, tourist base, hospital and museum. Its return to the Orthodox Church began in 1994, after the end of the war. The scenic setting of the New Athos monastery by the sea has made it a popular destination with Russian tourists visiting Abkhazia. This grandiose and majestic construction took 15 years to be erected and today is one of the most famous shrines of Orthodox Christianity. The monastery is located 75 meters above sea level at the foot of Mount Iberia near the ancient St. Simon Canaanite Church. From the distance the monastery looks like a fairy tale city from Russian folklore, with majestic domes with crosses and golden cupolas of churches. Four monastic buildings (with cells and household premises) form a closed square inside in which there is a huge territory. The big churches are the three-domed Church of the Ascension, Andrew the First-Called Church and Athos Saints Church. Next to them there is a wide multi-colored road leading to the high arched gate. In the centre of the western building stands the 50 m bell tower with a clock. Under the bell tower there is the monastic refectory which frescos painted walls just like in the small churches. But the most grandiose construction of the monastery is St. Panteleimon Cathedral. It is impressive not only by its size: length – 53.3 m, width – 33.7 m, but also the beauty and architecture of the interior. The cathedral is crowned with five domes. The central one is 40 m high. The interior walls were richly painted in 1911-1914. The frescos vary in the combination of blue, brown and golden tones. The cathedral is the largest cult structure of Abkhazia. More than three thousand people can be present there simultaneously. Simon the Canaanite – one of Jesus Christ's Apostles – came with the first Christian missions there in the first century AD. According to the tradition the angry local residents killed the righteous person with stones where New Athos Monastery is located. Long before the monks came there from Mount Athos a temple was built on the site of Simon's burial. This temple is one of the oldest active ones in New Athos. It stands on the left bank of the Psyrtskhi River. The temple over the tomb of the Apostle was constructed during the period from the 11th to 13th centuries. The last reconstruction was completed in 1882. Later it became the Tskhum Cathedral. The church building also served the place of burial for clergymen of the Tskhum diocese. One of the stones in the altar wall has the inscription in Greek about the burial procedure related to the Greek period of Anakopia. The church was richly decorated by wall paintings. Today you can see the fragments of the restored ancient frescos. Every year thousands of pilgrims gather in the church to honor the memory of St. Simon the Canaanite on May 23rd. Next to St. Simon the Canaanite Church there is a cave where he lived and prayed during his last years. The cave is a natural recession in the rock (Psyrtskhi Gorge). The cave walls are decorated with ancient mosaics, crosses, inscriptions, icons, lamps. In 1884 the cave was sanctified. Since then the icons of St. Andrew the First-Called and St. Simon the Canaanite has been kept there. The believers leave notes there with requests for health and peace of souls. The cave is located not far from the St. Simon's place of martyrdom. One of the stones there bears his footprint. This is a news report from 2008 which depicts New Athos Monastery. Monks from the New Athos Monastery were performing services for both Georgians and Abkhazians in the hope of uniting them through their common Faith.